For those who are at risk for stroke, consuming a healthy diet can be beneficial in order to help prevent the disease. In particular, consuming “white” fruits and vegetables, such as apples and pears, may be one of the most effective strategies available. According to a new study in “Stroke: Journal of the American Heart Association”, over 20,000 adults had their dietary habits analyzed over the course of 10 years in order to determine any correlation between food choices and stroke risk. At the end of the study, researchers found that the incidence of stroke was 52 percent lower in those who regularly consumed white fruits and vegetables, leading the researchers to suggest that these types of food would be highly beneficial for those who are at risk for stroke. In the study, the term “white” fruits and vegetables was used to describe those that contained white on the inside of the food rather than the outside. These types of fruits and vegetables included apples, pears, bananas, cauliflower, chicory, and cucumber. Of these fruits and vegetables, apples and pears made up roughly 55% of what subjects chose to consume. Although all types of fruits and vegetables provide many health benefits to those who consume them, those that were white were the most beneficial in this study. Overall, regularly consuming fruits and vegetables is one of the most effective strategies to improving health. 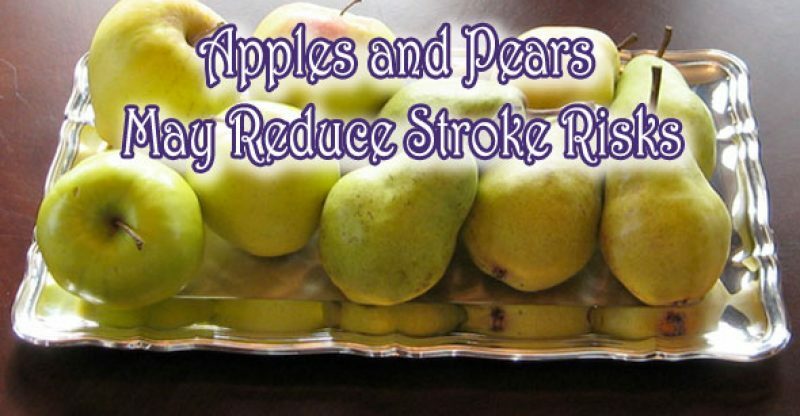 For those who are at risk of stroke, few foods can be as beneficial as apples or pears.